Description of "A 'Psycho' Path"
The book is a collection of short stories and articles written as blog posts during the final year of the author's college life. Mostly based upon the happenings around him and the lessons he has been taught. Let your mind wander through the bizzare imaginations ans perspectives of an Engineering student who tried hard to follow what he loves. This work is licensed under the Creative Commons Attribution-ShareAlike 3.0 Unported License. To view a copy of this license,E visit http://creativecommons.org/licenses/by-sa/3.0/. The author is a B. Tech, Computer Science Engineer (2008 - 2012) who is passionate about free software as well as writing. He believes in "Following what one loves" and as such brings out his love for writing through "A 'Psycho' Path". 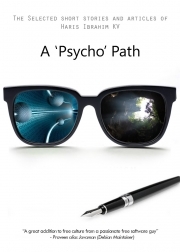 Reviews of "A 'Psycho' Path"